Oil pulling is an age old Ayurveda process which works on the root cause of symptoms and helps the body in its healing process, hence takes significant amount of time in giving you the desired results. The cost is the price of a daily spoonful of coconut oil–cheaper than even a vitamin tablet. Yet it is one of the most powerful forms of therapeutic techniques available. Oil pulling or oil swishing involves swishing oil in the mouth Ayurvedic literature describes oilpulling as capable of both improving oral health and treating serious and systemic diseases such as diabetes mellitus or asthma. According to Dr. F. Karach, M.D, oilpulling is very simple, completely harmless, and inexpensive therapy which totally heals head-aches, bronchitis, tooth pain, thrombosis, eczema, ulcers and diseases of stomach, intestines, heart, blood, kidney, liver, lungs and women’s diseases. It heals diseases of nerves, paralysis, and encephalitis. It prevents the growth of malignant tumors, cuts and heals them. Chronic sleeplessness is cured. Oil pulling works the same way as cleaning soaps. Soaps are basically fats that attract germs in order to clean. 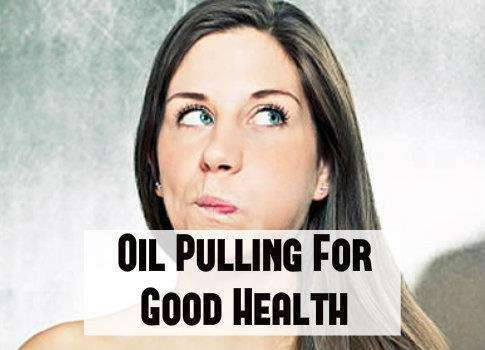 Oil pulling attracts germs and bacteria to ‘pull’ them out of your mouth. It cleans your gum line without damaging your gums. It has been known to cure problems with bad breath, and helps with gum inflammation. It can also help prevent and reverse tooth disease. Oil pulling therapy can be done using oils like sunflower oil or sesame oil. The sesame plant (Sesamum indicum) of the Pedaliaceae family has been considered a gift of nature to mankind for its nutritional qualities and desirable health effects. Sesame oil is considered to be the queen of oil seed crops because of its beneficiary effects. However, coconut oil is the most pleasant inside the mouth and many suggest the most effective.